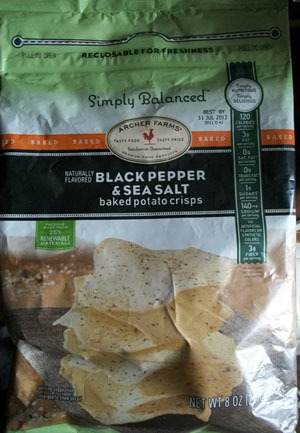 Topping the list this week are Archer Farms Black Pepper and Sea Salt Baked Potato Chips. Archer Farms is the Target store brand. Pretty much all of their crunchies are delicious. Flavor: Delivers a satisfying crunch with that slight sweetness that seems to always be present in baked potato chips. The pepper and salt add a little kick. Special Note2: Bag is 25% derived from “a plastic made from plants.” So the bag is a little loud when you handle it but not as loud as those discontinued SunChips bags. Special Note3: The bag is resealable. ← Snack #3: Seven-Eleven Brand Original Kettle Style Potato Chips.